The Dell is a haven of tall trees, cobbled paths, cool shade and running water. In this area of the Garden you will find shade-loving plants such as ferns, tree ferns, Streptocarpus species, Plectranthus species, Impatiens species and Mackaya bella, among others. This is the place to be on a hot summer day. The Dell was one of the earliest developments in the Garden. A constant supply of fresh water, particularly during the dry summer, was vital for the development of the Garden. The first nursery, in use from 1913 until 1924, was established at the lower end of the Dell, beside the Bath stream. The rock stepping stone path through the Bath Stream was begun in 1914 and ferns, tree ferns and Streptocarpusplanted. In the early years it was called the ‘Fern Dell’. 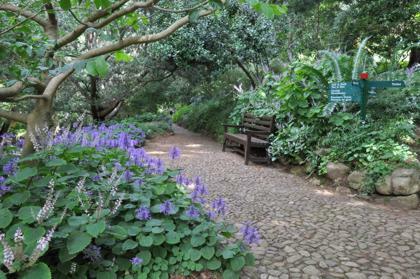 Read more about the early years of Kirstenbosch on the History page. In those early years the Dell was filled with oak trees, but their dense mat of surface roots and tremendous fall of leaves made it nearly impossible to grow things under them. They persevered for a number of years due to the fact that the public were fond of the oaks, but finally in desperation, most of those in the Dell were removed. The improvement in the growth of plants was immediate, and they were replaced with indigenous trees, such as Anthocleista grandiflora (forest fever tree), Ilex mitis (African holly), Syzygium cordatum (water berry), Podocarpus latifolius (real yellowwood), Podocarpus falcatus(Outeniqua yellowwood) and Podocarpus henkelii (Henkel’s yellowwood).